We're now pleased to offer a range of Club Build kits. If finances are tight then why not consider building your own winch using our major components? We can offer various levels of build together with as much help and advice as you need. Download the data sheets below to see which components are available together with their latest prices. For more details see the club build page. The throttle guide is a setting guide for Skylaunch's unique winch throttle setting system. PLEASE NOTE it should be treated AS A GUIDE ONLY, and you should adjust it in the light of your own experience with your machine / airfield / pilots / gliders etc. See the throttle guide page for more info. The throttle control system is unique to Skylaunch winches - preset selectors for glider air speed/tension and head wind speed to launch ALL weights/speeds of glider – any glider type is accurately launched with ease (throttle is damped to control acceleration rate). 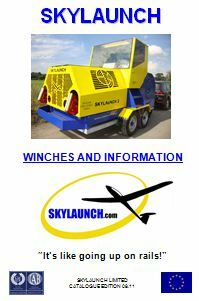 Existing winch drivers are typically converted to Skylaunch operation within 6 launches. This booklet contains information on all the winch range, options & accessories together with prices and most of the information contained on this web site. Please note - We update prices periodically so we can not guarantee that all prices in this booklet are completly up to date - Pease contact us to confirm prices or to provide you with a full quotation. This booklet contains information and prices on everything from weak links to cable and engine parts. Please note - We update prices periodically so we can not guarantee that all prices in the booklet are completly up to date - Pease contact us to confirm prices or to provide you with a full quotation.